As a young boy, Whiteley was fascinated with bird's eggs and nests, often collecting them and persuading others to collect for him as well. 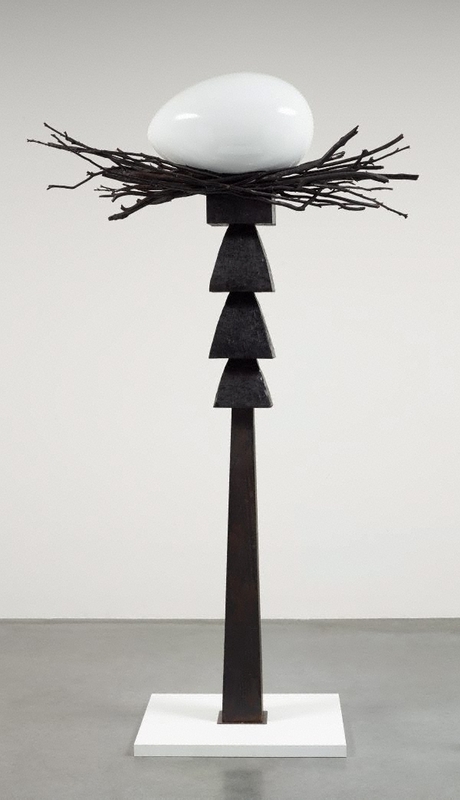 The egg - a recurring element in his work - is traditionally a symbol of fertility. Brancusi considered it the perfect form. Whiteley has evoked a sense of celebration by exaggerating size and scale to create this fantasy totem. He was also fascinated by the traditional burial poles of northern Australian aborigines which he saw at the Art Gallery of New South Wales. In them he saw a sense of growing upwards from the ground. Robert Gray, Art and Australia (Vol. 24, No. 2) , 'A few takes on Brett Whiteley', pg. 216-224, Sydney, Summer 1986, 223 (illus.). Humphrey McQueen, Art and Australia (Vol. 17, No. 1) , 'Brett Whiteley', pg. 45-52, Sydney, Sep 1979, 50 (illus. ).